Modernizing Egypt, A continued hope for all of us. Muhammad Ali - "I am well aware that the (Ottoman) Empire is heading by the day toward destruction...On her ruins I will build a vast kingdom... up to the Euphrates and the Tigris. Muhammad Ali, recognized the need to modernize. As we do here today. Muhammad Ali’s goal was to establish a powerful, European-style state.To do that, he had to reorganize Egyptian society, streamline the economy, train a professional government, and build a modern military. Muhammad Ali built an industrial base for Egypt. His motivation for doing so was primarily an effort to build a modern military. Consequently, he focused on weapons production. Factories based in Cairo produced muskets and cannons. With a shipyard he built in Alexandria, he began construction of a navy. By the end of the 1830s, Egypt’s war industries had constructed nine 100-gun warships and were turning out 1,600 muskets a month.However, the industrial innovations were not limited to weapons production. Muhammad Ali established a textile industry in an effort to compete with European industries and produce greater revenues for Egypt. Beyond building a functioning, industrial economy, Muhammad Ali also made an effort to train a professional military and government. He sent promising citizens to Europe to study. Students were sent to study. 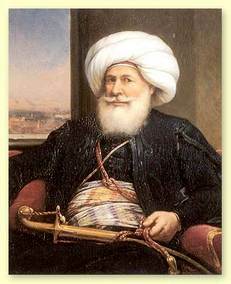 He then used both educated Egyptians and imported European experts to establish schools and hospitals in Egypt. The European education also provided talented Egyptians with a means of social mobility.